Still fluffy after changing cases multiple times and being used on different beds. 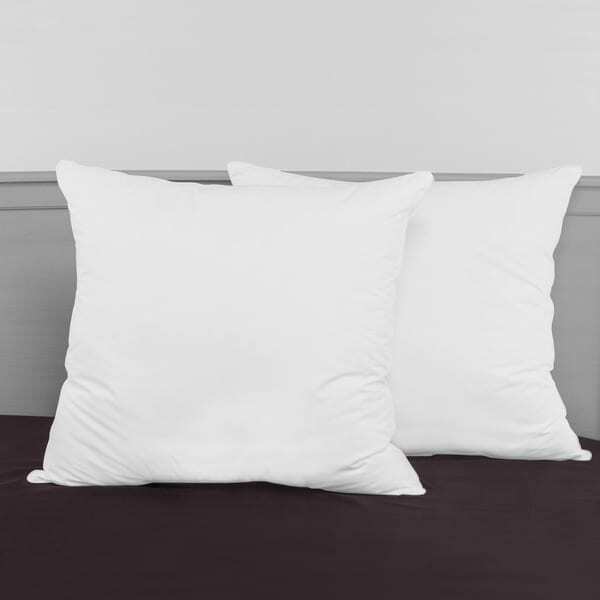 Update the look of your bedroom with the SwissLux decorator 28-inch euro square pillows. These pillows feature a soft 100-percent cotton construction with a plush polyester fill that provides hypoallergenic comfort. Please note: Pillowcases are not included. My pillow shams measure 26 x 26 but in hopes of obtaining a full look, opted to try these 28 x 28 Euro Pillows. They filled them completely corner to corner without overfilling resulting in the pillow showing or bulging out of the back insert pockets. I am very pleased with this purchase and the appearance of my daybed pillows. If you have similar needs, you won't regret this purchase. The smaller pillows sized the same as the shams would not have filled them to capacity and would have resulted in disappointment. I'm so used to getting 26 inch pillows, and these are 28 inches! The sham was actually completely filled up. Loved the pillows! Size is great - the 28 inch fills in the 26 inch Euro sham perfectly. Now I want to replace my 26 inch ones for another set of these. Price is best I've seen for the quality of these pillows. I bought 26" euro shams from****but the 26" pillow inserts I found at stores did not fit. The pillows were all too small for the shams. I took the advice of people on here and bought these euro pillows and they are perfect! They fill out the shams and are very good quality. Would recommend. Pillows were used for a 26 inch Euro Sham Case. Probably a 30 inch pillow would have been an even better choice. Pillows are a little lumpy but did the trick. Definitely seek a pillow insert larger than 26 inches for a sham that is listed as 26 inches, otherwise you'll never fill to the edges. The SwissLux Decorator Euro Square Pillows set was exactly what I was looking for. Loved the firmer but soft/plush feel. I sleep like a baby on these pillows. After reading the reviews, I bought the 18 inch pillows for my 16 inch square shams. They fill it up nicely and the sham looks taught but there is some give to it which is nice since it is on my daughter's bed. She likes it a lot. Like others, I purchased these for a 26x26 sham, and the fit is perfect. It's tight, but I prefer them to fit snug versus loose. My fiance decided to purchase a set of euro pillows for our other bed and went to buy them at a local department store. He paid $14.00 for each one, and the quality of them isn't near what I received from Overstock and I paid less. I would recommend these pillows to anyone. They look great and are a great value! The PERFECT, OVERSTUFFED LOOK for my 26" x 26" Euro shams!!! Just like the pillows you see in designer magazines and on TV design shows!!! At night, they're like sleeping in the clouds...supportive, yet cushy and dreamlike. It's always a competition to see who gets to use these for sleeping at night... LOL Much better than other Euro shape pillows... Glad I purchased them...well worth the investment!!! They don't deflate, either. Nice pillows. I used them for some decorative euro shams that called for 26" but I got these 28" so they would be sure to be completely filled out. They fit fine. Recommended. These pillows are HUGE and super puffy. We bought them to use behind our regular pillows, when propping up in bed. They were exactly what I wanted and a great price. I purchased these Euro shams due to the many positive reviews and boy was I disappointed. I use them mostly for decorative purposes and rarely use them to rest on against my headboard. In the last 2 months that I've had them, they have gone flat and are limp. This does not look pretty at all when I have my bed all made up. So unhappy with this product. I could literally fit a whole new euro sham in each of the pillow covers. That's how flat they are. Very disappointed. Wish I had purchased this item from Bed Bath and Beyond or somewhere that I could return them. They weren't exactly cheap and now I'm stuck with them. These are super comfy pillows. These are perfect for propping up in bed to watch tv or read but I can easily fall asleep because they are super comfortable. I couldn't bring myself to pay the price for pillow covers so I made my own. Great buy! 26x26" (65x65cm if you're an Ikea shopper) pillowcases/shams are a must if you're looking for that full, fluffy look. Definitely makes your bed look like it was pulled from an expensive bedding advertisement. Quality great for the price! Works great in my shams! Only using as decorative so works great! Nice pillows hold shape well, very comfortable. Bought them for 26 x 26 euro shams. The 28 inch pillows fill the shams from corner to corner. Love them. These are very large pillows so if you're looking for something to fill those euro shams, this is it. These fit the euro shams that came with a bed-in-a bag. They are a full 28" and very lofty. I think they're a little pricey for what they are (nobody actually sleeps on these, do they? ), but otherwise, satisfied with the purchase. These are very full and work great! "How many oz of fill do these have?" "Are these only 2 inches deep??? Surely there is a misprint in the dimensions of these pillow inserts! OR are these pillows REALLY ONLY 2 " DEEP? At that dimension how can so many reviewers find them to successfully fill a 26x26 sham so firmly? Please confirm the dimensions of the finished insert for me. Thank you." No, they’re not only 2” deep there just like regular euro pillows. It must be a misprint. They will fill your shams perfectly. "Do these pillow come compressed when shipped? I’ve ordered some pillows that come in compressed, vacuum sealed bags and I’m wondering if these euro pillows do too?" These pillows do not come compressed. They were shipped in a large box. No, they do not come compressed. They arrived in a large box, nice and fit the pillow shams beautifully. These pillows are not compressed when shipped. The come fully fluffed in one large box ready to go! "I need (3) inserts -do they only come in sets of 2? Plz advise Plz lmk if available"
These are only available in sets of 2. "Are these good to sleep on or just for looks?" I find them a little "crunchy", so would probably not be great for sleeping. I wouldn't use them for sleeping. Very full and good for shams. If you like a lot of loft, they are good for sleeping as well as filling a Euro sham nicely. "Do these pillows need covers or people just use them just how they are?" These are inserted into decorative covers for the bed. Not a pillow to sleep on. In my opinion, these pillows need covers. They are decorative pillows. I suppose they could be used 'as is' if the bedding decor is pure white. However, a removable cover is washable, and I prefer to have something I can keep clean and fresh. "I can't seem to find 28x28 shams for these pillows ??? Please help. Thank you." We bought a bed set with 26 X 26 Euro Shams, the 28X28 pillows work perfectly. Confusing I know, we were in the same spot, but they work perfectly. They are called EURO. They are quite common. This size is often used in europe.